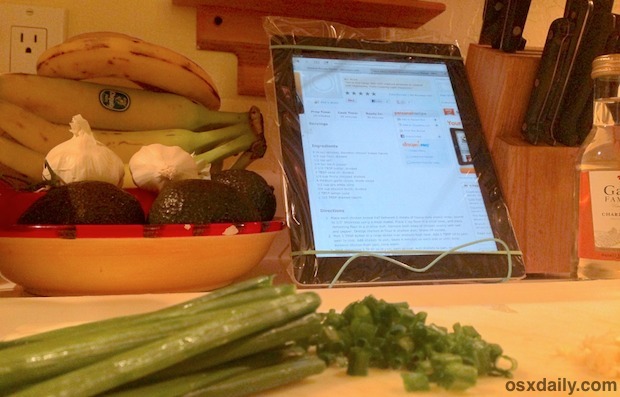 The iPad is a great cooking tool that’s perfect for keeping track of recipes and being the ultimate kitchen resource, but if you’ve ever cooked with an iPad you’ll know the screen can get pretty mucked up with various ingredients, and if you aren’t careful it could even damage the device. Thankfully, another kitchen item can completely prevent the iPad from becoming a mess throughout the cooking process: a clear plastic zip lock bag. This great little trick and picture comes to us from one of our readers, and there really isn’t a whole lot to it. Slide the iPad into a medium to large sized clear ziplock plastic bag. If there’s any excess room left in the bag, carefully fold the zip locking part of it behind the iPad itself, and use either tape or a couple rubber bands to secure the excess parts of the bag behind the iPad, keeping the fit tight. A close fit is important to keep the touchscreen responsive, any room between the plastic and the glass screen will create lag or make it not respond to the touch as expected. Once the iPad is securely in the plastic bag, use it as usual in the kitchen, without being afraid of getting cooking materials on the screen from hands covered in ingredients or splashes. It’ll even offer some level of liquid protection, though you probably wouldn’t want to submerge it since ziplock bags obviously aren’t intended to waterproof gadgets. An excellent addition to this trick is to stop the iPad screen from dimming or turning itself off, either by raising the auto-lock timer to a longer period of time or by setting it to “Never” – just remember to switch the latter choice back again or else it’s very easy to run out a battery. This allows you to not have to constantly touch the screen to keep it awake, and also prevents the need to unlock it if it does go dark. Also, you’ll probably want to set the iPad on a stand of some sort, either with something like the iPad kitchen rack or even a low-budget solution like the do-it-yourself stands that are completely free, but obviously not quite as fancy. I tested this out myself by placing an iPad into a large freezer bag and it works exactly as suggested, the touch screen remains very responsive so long as the fit within the bag is tight, keeping the plastic close to the screen. Unfortunately, the ability to cook doesn’t come along for the ride, but at least you’ll be able to follow some recipes and not worry about damaging your pricey iOS gear. This works on an iPhone and iPod touch too of course, and outside of the kitchen it would also be very useful in workshops, gardens, hobby desks, and just about anywhere else that you want to use an iOS device but keep it protected from all kinds of goo. Thanks for the tip and picture Elizabeth V.! I’m an art student and I do exactly this when I’m painting and using charcoals. Learned my lesson the hard way beforehand, white iPad does not like oil paints at all, hehehe! I am pretty sure there are dedicated splash-proof cases intended for hobbyists and cooking, or even a general rugged toughcase should do the job. Is there not a danger of heat buildup? My iPad only gets warm when I am streaming videos online otherwise it’s cool as can be. Good news if it were getting too warm there is a built in feature that will shut your device down if it gets too hot. I live in South Florida and seen this save my phone from overheating a few times. As an additional tip: what works even better is cling film. The touchscreen just keeps on working when you wrap your device in cling film. Chefs I know put their touch-screen phones in vac-seal bags. They’re a hint more sturdy than a zip-lock bag and it’s completely water-tight. And as a side note to the ziplock bag idea – put it in “upside down”, so the zipper is down. Accumulated stuff flying around won’t collect in the crack, and have the chance of migrating inward.